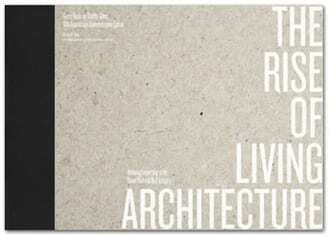 The Rise of Living Architecture Commemorative Edition celebrates the contribution of more than 50 leading experts to the development of the green roof and wall industry over the past decade. Leadership profiles are drawn from a wide range of business, academia, policy and design professionals. These extraordinary individuals share their greatest accomplishments and views on the future development of the industry. The Rise of Living Architecture is a beautiful book designed by award-winning Ian Rapsey, and includes a foreword on Restorative Design by celebrated academic Stephen Kellert, Yale University and an essay on the transformative power of living architecture by Steven W. Peck, Founder and President of Green Roofs for Healthy Cities. The outstanding photographic work of Brad Temkin (www.bradtemkin.com/rooftop) is featured throughout this limited edition work, which will be available for signing during the trade show on Thursday October 18, at the 10th Annual CitiesAlive in Chicago.